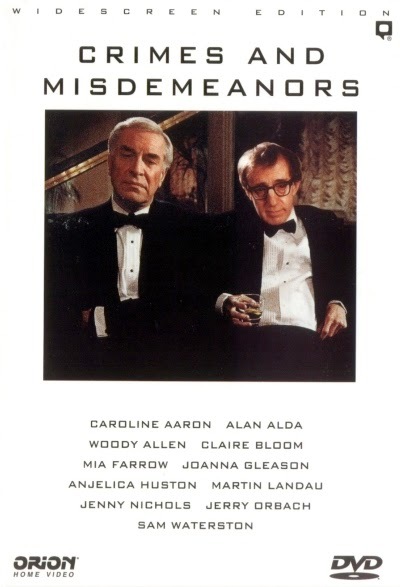 Crimes and Misdemeanors, one of Woody’s most ambitious and haunting works, was a marvelous blend of his life-long penchant for witty and humorous dramedies on urban neurosis, with his growing interest in dark, bleak and chilling examination of morality and existence borne out of his admiration for Bergman. It comprised of two loosely-connected, inter-weaving stories each of which could have been expanded into full-length features – Judah Rosenthal (Martin Landau), a wealthy, ageing family man who’s renowned as an ophthalmologist and a philanthropist, is secretly plagued by his emotionally unstable mistress (Anjelica Huston), thus forcing him to take assistance of his brother (Jerry Orbach), who has contacts with the underworld, in order to be released of the quagmire, only to be left deeply troubled by the moral consequences of what follows; Cliff Stern (Allen), a documentary filmmaker struggling to complete his pet project on a little-known philosopher (Martin S. Bergmann), reluctantly agrees to direct a profile on the successful but incorrigibly smug and pompous brother (Alan Ada) of his wife (Joanna Gleason), with whom his marriage has hit rock bottom, whereupon he meets and starts falling for a lovely and intelligent TV producer (Mia Farrow) on account of their shared interests and tastes. The rich tapestries and emotional profundity of the two contrasting and yet mutually reinforcing storylines – brilliantly photographed and incredibly enacted by the ensemble cast – powerfully touched upon such themes as crime and punishment, guilt, redemption, personal reconciliation, disillusion, marital breakdown, unrequited love, existential dilemma, and crisis of faith. Saura began the 70s, easily the most explosive and devastatingly brilliant decade of his illustrious career, with The Garden of Delights. An absurdist, allegorical, subversive and trenchant socio-political critique of the Franco era, and the callous, self-serving allegiance of the bourgeoisie towards the dictator’s draconian regime in particular, the film served as a fabulous pre-cursor to his ‘Trilogy of Memories’, and the masterful Cousin Angelica in particular, in its incisive infusion of surrealism and memory as a dominant narrative device. Antonio (José Luis López Vázquez), a middle-aged man, and formerly a powerful businessman, residing in a palatial mansion, has become afflicted with amnesia, partial paralysis and speech impairment after a road accident, prompting his ageing father (Francisco Pierrá), his wife and his children to participate in a grotesque and elaborate game of recreating key incidents from his life in order to revive his lost memories. As is eventually disclosed, the reasons aren’t strictly borne out of familial love and care; rather, in order to recover the key to where his wealth is stashed as, post his handicap, the family’s fortunes have taken a nosedive taking them close to bankruptcy, even though their elaborate lifestyles might suggest otherwise. The hypocrisy, self-centeredness, superficiality and corruption that pervade their lives, and in turn Franco’s anti-Fascist stance, was laid threadbare in this brilliantly concocted work. The marvelously staged sequence, where Antonio’s communion at the hands of an orthodox and parochial priest is brought to a halt by a mob of rebels at the backdrop of the Spanish Civil War, was the film’s indictment of Franco’s pet institutions at its most decisive and memorable. The aptly titled Swedish psychological drama Force Majeure provided a pointed jab on the social construct and presumptions that form the basis of the conventional definition of a family. The split-second choice that results out of a sudden and unavoidable catastrophe was used by the director Ruben Östlund to launch a potent commentary on the patriarchal nature of our social fabric, with husbands and fathers playing the traditional role of protectors and saviours, thus making this both an effective marriage drama and a sly social satire. Tomas (Johannes Bah Kuhnke), a wealthy Swedish businessman, while on a 5-day skiing vacation in the incredibly scenic and tranquil French Alps with his wife Ebba (Lisa Loven Kongsli) and their two kids, panics, in a disastrous choice, flees, when a controlled avalanche goes awry. Even though, eventually, the moment of panic seems ill-founded, the very fact that his survival instincts had gotten the better of his judgement start slowly eating away the very foundation of their marriage – it starts with little itches and gradually evolves into a full-blown crisis which takes them dangerously close to marital collapse until, in another unanticipated, but in this case fortuitous development, an act of masculinity and courage restores his place of honour in the family. In one brilliantly staged sequence, the relationship between their friend Mats (Kristofer Hivju) and his young girlfriend (Fanni Metelius), experience a mini-crisis when they become inadvertent witnesses to Tomas and Ebba’s growing marital breakdown. Heavily recalling Haneke’s cinematic style, the stark, blinding white visuals marvelously captured the film’s wry and cold tonal palette, and its unsettling critique of bourgeois banality, hypocrisy and conflict. 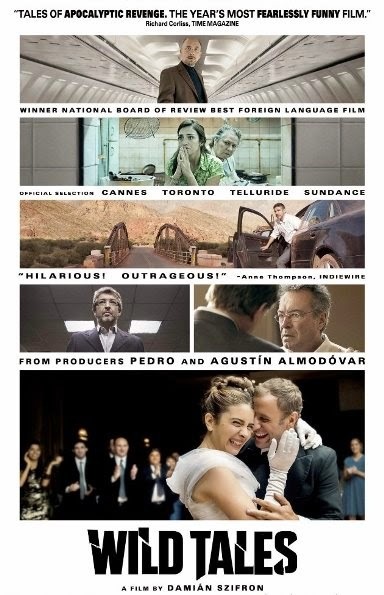 Like Jia Zhangke’s masterful hyperlink film A Touch of Sin, Wild Tales is that rare anthology film where every segment packed as much punch as the other, and rarer still given that all the episodes have been directed by the same filmmaker. 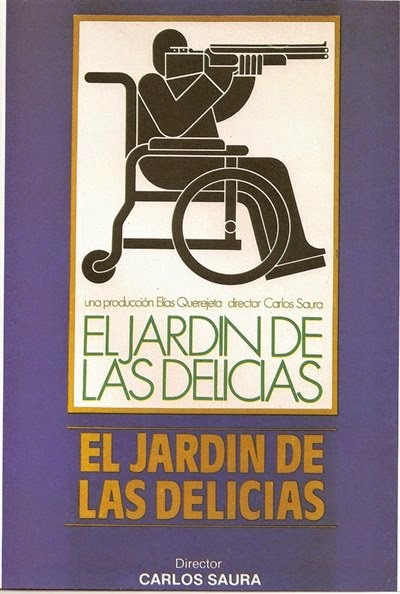 This lacerating satire, set in contemporary urban Argentinian milieu, provided a brutal, pungent, wickedly funny and powerful critique on the discomfiting ironies, hypocrisies, self-centeredness, corruption and destructiveness amongst human populace, with revenge being the connecting motif. 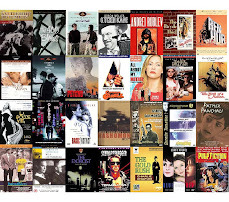 The film comprises of 6 terrific shorts of varying lengths each of which could have been elongated to feature lengths – in ‘Pasternak’, the shortest of the lot that superbly set the tone, passengers aboard a doomed plane discover a carefully orchestrated link between themselves; in ‘The Rats’, the waitress at a diner discover the chance to get even with a brutish politician thanks to a sociopathic cook; in ‘The Strongest’, a vicious segment reminiscent of Duel, two men driving cars on a highway go to ludicrous lengths for the sake of one-upmanship; in ‘Little Bomb’, reminiscent of Falling Down, a demolitions expert reaches a state of breaking point when his car keeps getting towed away for no fault of his; in ‘The Proposal’, a wealthy business man, on his sleazy lawyer’s advice, devises ways for saving his son who has accidentally killed a pregnant lady while driving; and in the Felliniesque ‘Until Death Do Us Part’, a boisterous wedding party turns rather ugly for all concerned. 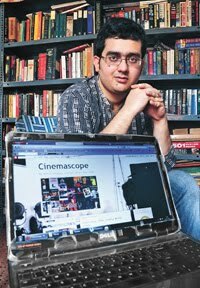 The film’s Kafkaesque, jet-black humour, along with the increasingly farcical and unexpected turns that the tales take, brilliantly counterpointed and mercilessly projected its bleak and cynical social commentary, and in turn constructed a fabulous microcosm of our society. Tales of marginalized and delinquent youths living carefree lives filled with violence and crime, and by their own moral codes governed by ‘here and now’ and a royal disregard for the powers that be, only to be eventually consumed by the ambit of crime and punishment, has been a theme covered memorably on numerous occasions, in noirs and counter-culture films of US, Japan and elsewhere. 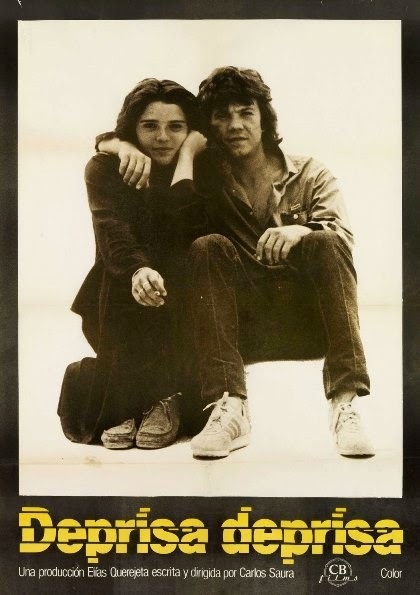 Deprisa Deprisa, the film that Saura began the 80s with and a final tryst for the time being with socio-political commentary before he dramatically changed gears with Blood Wedding, provided a distressing but lyrical portrayal of a socially and morally displaced generation, and evoked memories of Oshima’s Cruel Story of Youth, among others. The film comprised of a quartet of young adults whose quiet and sensitive natures are in direct contravention to the world of crime around them – Pablo (José Antonio Valdelomar), his pretty sweetheart Ángela (Berta Socuéllamos), his buddy Meca (Jesús Arias) and an import to their group Sebas (José María Hervás Roldán). Though they keep making quick money through armed robberies and have good times in between, it’s obvious that their presents are as fragile as illusive are their dreams of a settled future. Their actions soon catch up with them when a bank heist goes horribly wrong, leading them to tragic, albeit anticipated, comeuppance. The washed out visuals, minimally used electronic score and liltingly captured themes of love, friendship and camaraderie, were very well juxtaposed with their harsh, bleak and unsustainable lives in the post-Franco void, thus further emphasizing the grand tragedy of their brief existences.